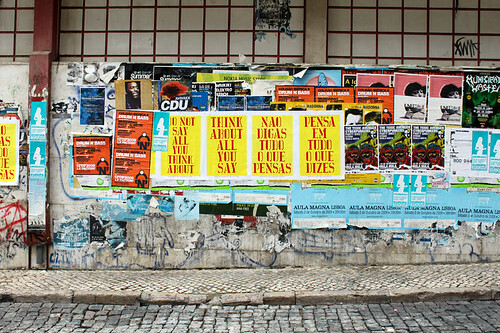 Above and below: Anthony Burrill’s posters for Timeless in situ, Bairro Alto, Lisbon, Portugal. Part of Experimenta 2009. The theme of Timeless is the idea of designers using or promoting local resources as part of their working method. 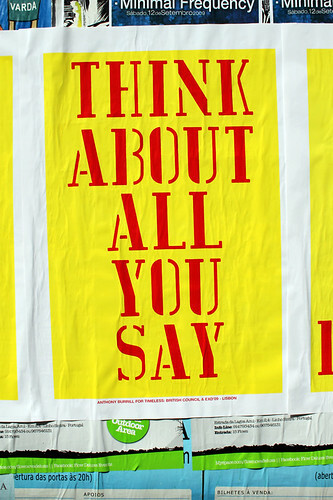 Since my move from London to rural Kent five years ago, I have by necessity been using local printers to make my work. 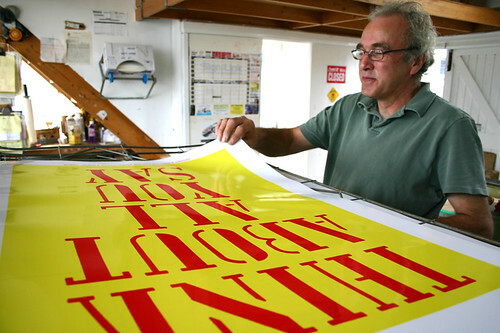 I was extremely fortunate in discovering Adams of Rye, a miraculous survival of a local wood type printers. It was my use of the local printers that the British Council were interested in forming part of the exhibition. We had a meeting in London where the idea of finding the Lisbon equivalent of Adams was suggested. 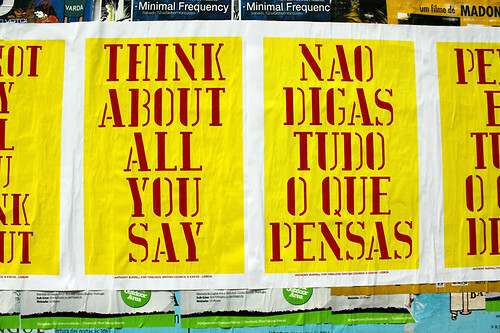 We decided it would be fairly straightforward to find a printer in Lisbon that still used wood and metal type, and use them to print a series of posters for the show. So I travelled out and met up with Isabel, from the Lisbon office of the British Council. we explored the beautiful city, trying to find our printers. 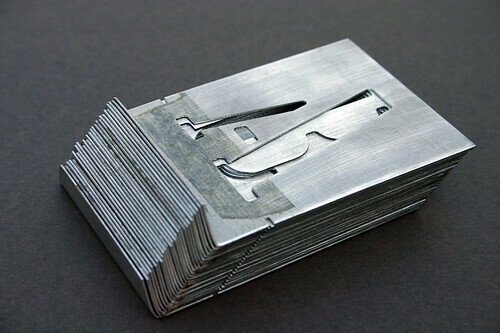 We went to one Lisbon printer who had an old Heidelberg press – just like the one they still use at Adams in Rye – but unfortunately he didn’t have any wood type, and his old Heidelberg had seen better days. 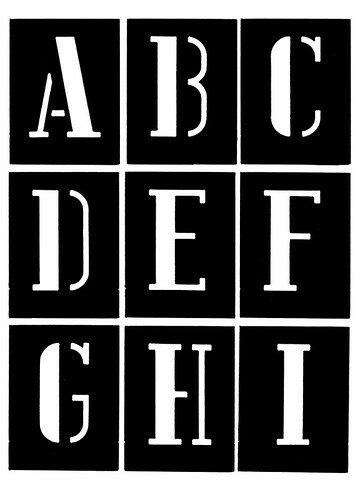 He suggested another place, but this turned out in a similar way: the printer had once used wood type, but had got rid of it all ten years ago. We carried on following up leads – it felt like being a private detective. We ended up in a small sign-makers’ shop. They had a great selection of signage, most of it fairly similar to the kind of stuff available anywhere (below). 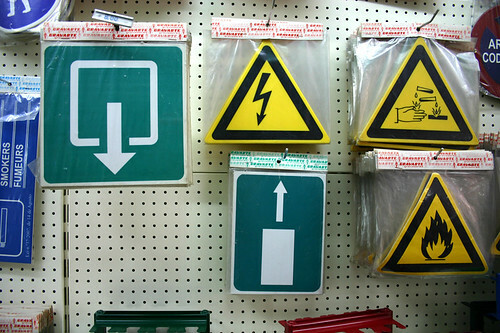 I had a look through the shop and found some beautiful stencils, made of finely cut metal, intended for sign writers. The typeface was quite unusual, I hadn’t seen one like that before. I bought the stencils and a few other bits and bobs and we left the shop. We still hoped that we might find a woodblock printer, but after a few more false leads we decided that all the woodblock printers in Lisbon had ceased working years ago. It was disappointing, but I still had my stencils! I talked to Isabel about possible phrases to use on the poster. 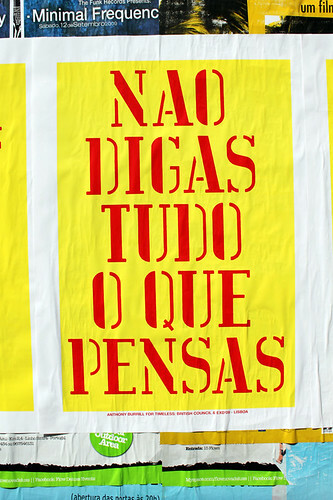 I wanted to use a local Portuguese saying which I could develop into a poster design. 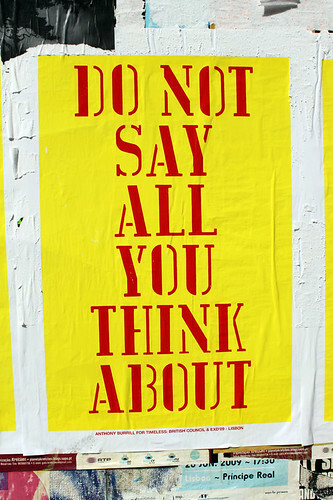 There were a number of suggestions, but her first was my favourite: ‘THINK ABOUT ALL YOU SAY – DO NOT SAY ALL YOU THINK ABOUT.’ I loved the phrase immediately, I liked the poetic way it turned round upon itself. It also sounds quite official, like something you would see on a sign in a library. When I got home, I had to decide how to make the work. The stencils were so beautiful I knew I had to use them. I tried to research the typeface, but found it hard to make any matches, so I decided it had to be specific to Lisbon, or at least to Portugal. I was hoping to use Adams as part of the project, but as I was using the Portuguese stencils there would be no need to use woodblock, so I used my alternative local printer – Steve, at Harvey Lloyd screens. I scanned in the stencil typeface and positioned the artwork in Photoshop. I made four designs in total, separating the phrase over two designs. and set it in English and Portuguese. Above and below. Posters in production at Harvey Lloyd. 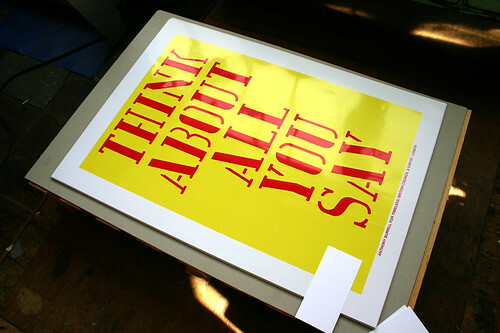 We screenprinted the poster in bright colours on shiny paper, a big flood of yellow, with the bold text in red. 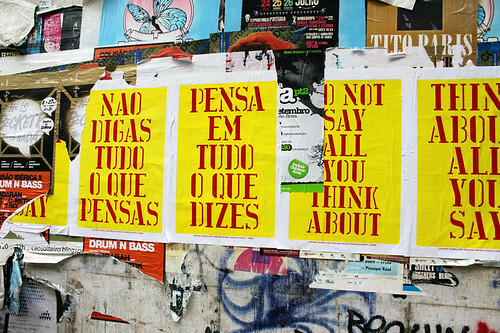 The posters were shipped out to Lisbon and posted around the city last week. The sites will be fully documented, and all the background information (plus all the other Timeless participants’ work) is being gathered in a central exhibition cork ‘wall’ designed by ABAKE. The show has had a very experimental feel, and it’s a nice reminder that chance and exploration are important element to include in the design process. 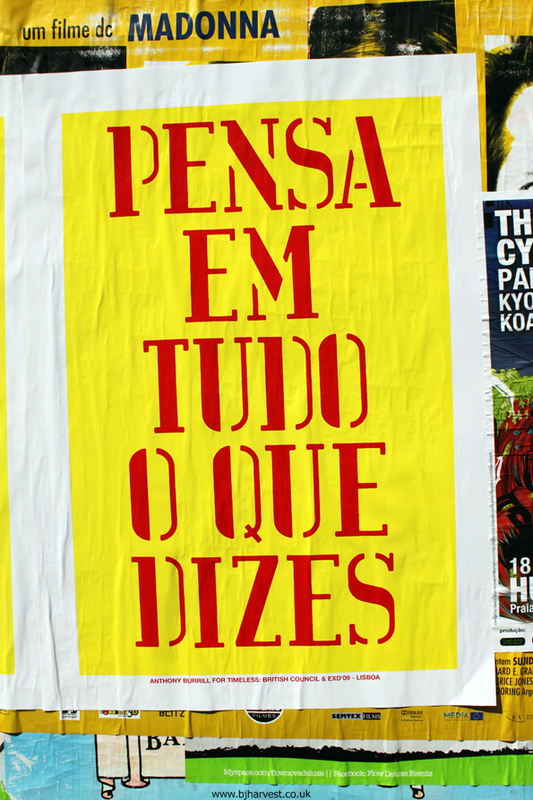 Above: Posters in situ, Bairro Alto, Lisbon. See also: ‘Letter-rich Lisbon’ in Eye 54, and ‘The word on the street’ in Eye 70.